pushes White along, taking territory and also reducing the liberties on the white stone. This is a typical pushing play, of the kind that can lead to a pushing battle. Pushing from behind is considered to be disadvantageous. Push in, push out, push through relate to a complex of different basic patterns, the Japanese de and degiri (q.v.). The Japanese noun directly corresponds to 'Push' is oshi. But if the move is on the third line or lower and touching the opponent's stone from below, the move is called a hai (crawl). Therefore in the above diagram is a hai, not oshi in Japanese. 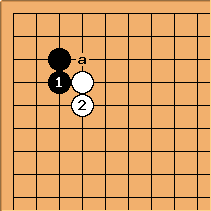 in these diagrams are both on the third line, but have different names -- they are decided by relative positions to the opponent's stones as shown.